UncategorizedThe Base Metal for Renewables Boom: The Start of a New Bull Market? This post is the fourth edition of a 20 posts collection with global data to explain the relationship of Solar PV and Wind Energy world markets with the mining industry (extractive industries). We will check the production of metals, industrial and construction minerals to build solar modules and windmills around the world. In the end of the article, you can find the links to the other 3 articles of the collection. In the following article, we will analyze specific metals and industrial minerals, however, in the present article, we are focused on the requirements for major families of minerals to build world Solar PV facilities. 18.38 million tons of Aggregates (included in the concrete installations supporting solar panels) meaning the 14.8% of total extractive industry materials. 38.63 million tons of Industrial Minerals (mainly low iron quartz), meaning the 31.11% of total extractive industry materials. 47.11 million tones of Metals, meaning the 37.94% of total extractive industry materials. 20 million tones for energy minerals (mainly metallurgical coal), meaning the 16.14% of total extractive industry materials. Energy, including fuel and electricity, for major materials involving the needs for minerals and metals, is a complex subject for discussion. We have to include not only the energy requirements for mining but also to transform into other products as metals or glass. We use the following source of information to determine the energy to take (on average) to produce 1 kilogram of the following materials in Lower Tech Magazine. The approach for Silver is made following the data of The Silver Institute. 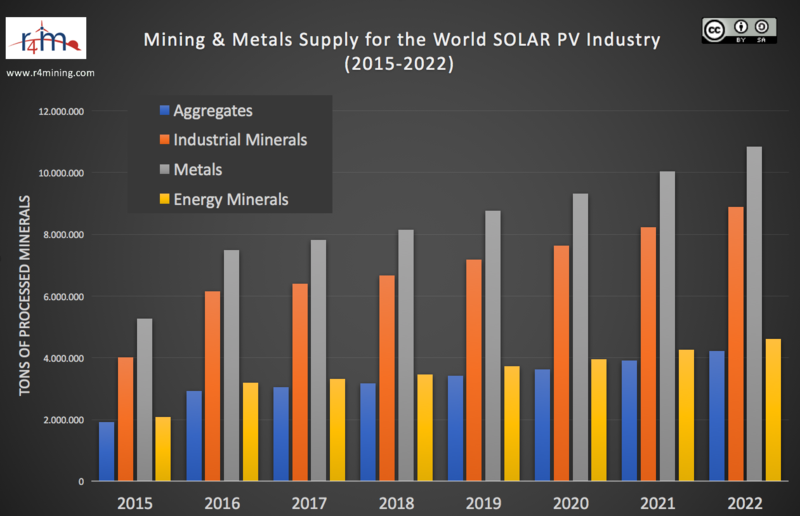 About 10% of global application of Silver deals to the Solar PV modules as Ross Beaty confirmed in the conference of Mines & Money Americas last October 2017. Electronic grade silicon (CVD process): 7,590-7,755MJ (2,108,700 to 2,154,900 watt-hours). Under next article, we will analyze the demands for Mineral & Metal Resources for Wind Energy Marketplace.